The Barred Owl (Strix varia) is common, though sparse, in much of Alberta’s forested regions. 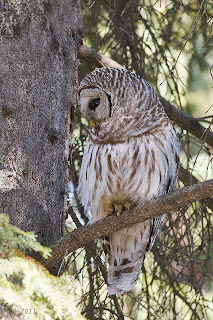 I have heard and seen them regularly in Edmonton’s ravines that are rich in the riparian habitat, with mature conifers, water and open spaces, that they like. During the day these nocturnal hunters tend to roost and doze rather high up and under cover of thick foliage, so spotting them is a challenge and getting good unobstructed photographs even more so. 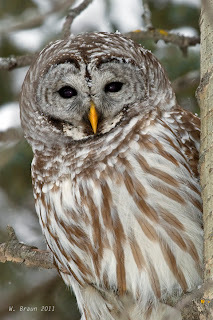 The Barred Owl is a highly vocal owl, giving a loud and resounding "hoo, hoo, too-HOO; hoo, hoo, too-HOO, ooo" which is often mnemonically phrased by ornithologists as "Who, cooks, for-you? Who, cooks, for-you, all?" – the last syllable descends and fades noticeably. Because the song has eight hoots, ending in a descending oo-aw, one of its nicknames is Eight Hooter. They will call in the daytime as well as at night. Now, during the mating and early nesting season, I most often hear them especially near dawn and dusk, then I try to follow my ear to their perch. They get their name from the white horizontal barring on the chest and vertical barring on the belly. They are round-headed with a whitish/brown facial disk with dark brown trim. 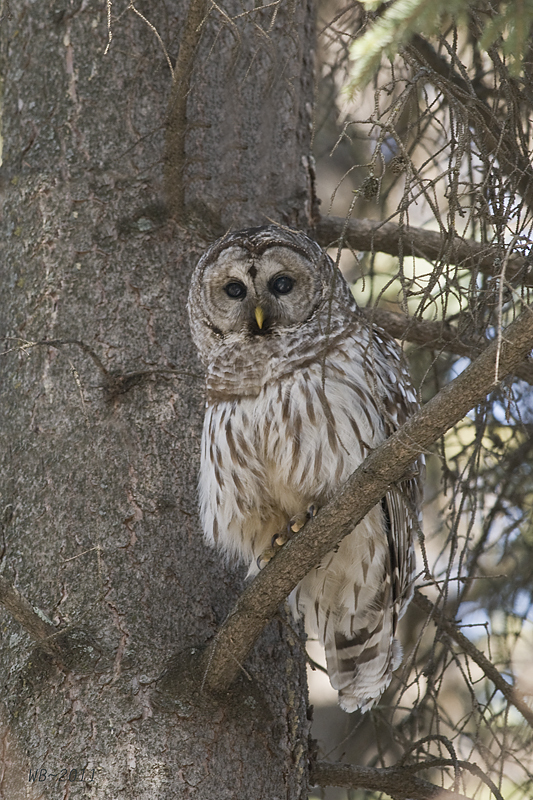 The eyes are blackish-brown, and the beak is bright yellow and almost covered by feathers. They have a long tail. There is no difference in plumage between males and the larger females. It hunts mainly from a perch, feeding on small mammals, birds, amphibians, reptiles, and insects. It prefers to nest in a natural tree hollow, but it will also use an abandoned stick nest of another species. I have read that they prey on birds on the wing, but I wonder about that, given their lumbering flight. 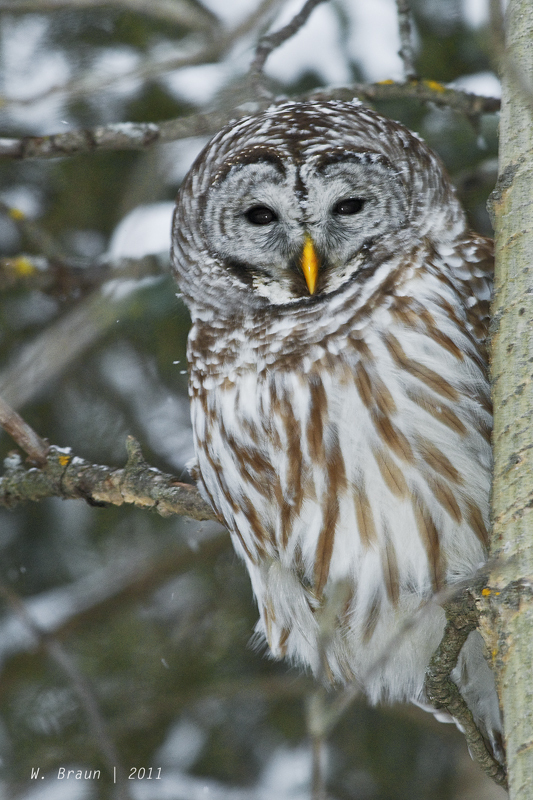 Being nocturnal hunters it is more likely that they take birds once they have settled into their nighttime roosts. Barred Owls have been known to live up to 23 years in captivity and 10 years in the wild. The Great Horned Owl is the most serious predatory threat to the Barred Owl. 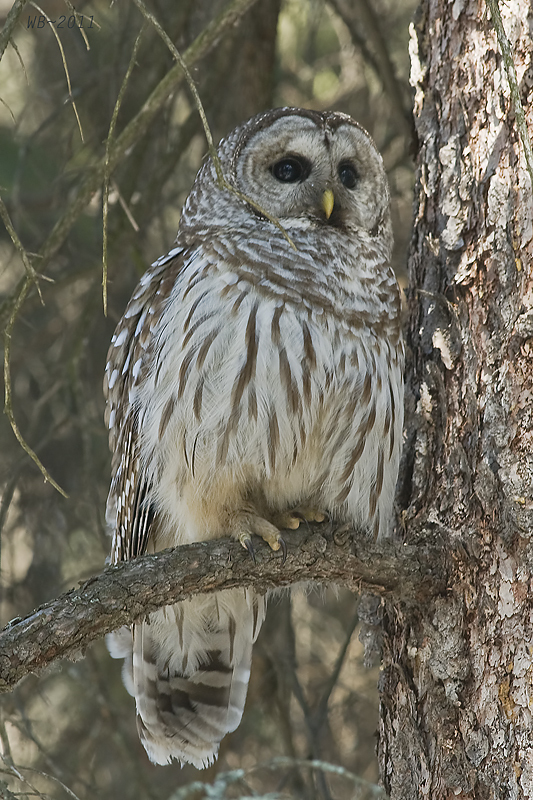 Although they often live in the same areas, the Barred Owl will avoid parts of its territory that is occupied by a Great Horned Owl. Wonder why its second Latin name is varia? In Latin, varia is a form of the word “various,” meaning diverse. 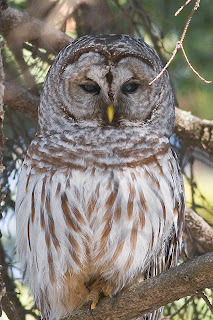 Barred Owls have also been known as Northern Barred Owl, Swamp Owl, Striped Owl, Hoot Owl (a widely used popular name), Eight Hooter (because it calls in a series of eight hoots), Round-Headed Owl, Laughing Owl, Crazy Owl, Black-Eyed Owl, Le Chat-huant du Nord (French for “The Hooting Cat of the North”) and Wood Owl, among others. I really like his black eyes! Why isn't one of his names Black-Eyed Owl? 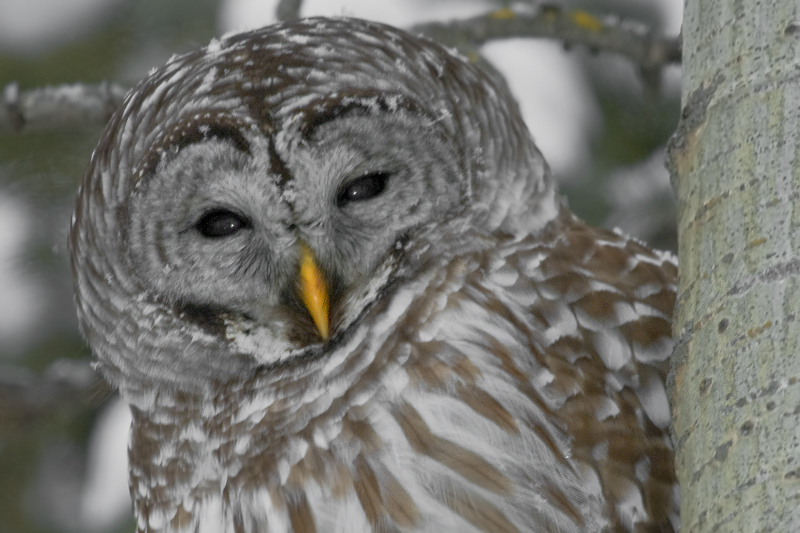 One of its names is Black-Eyed Owl. You'll it listed in one of the paragraphs in the blog. The pictures are so beautiful, did you take them yourself? Yes, all the pictures you see on this blog I took myself. It's what I do for fun when I have time. In the process of taking these photo's did you happen to be attacked by an owl, or got really close to one? Beacause i saw that one of your photo's was an amazing shot of an owl really close up!